First became popular in the 80’s because the price and versatility of the blocks appealed to many households and builders. 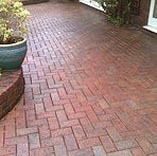 It has become one of the most frequently used paving options. that the surface is very high maintenance! If left unattended for a year or two big problems will start. The joints between the blocks will become infested with moss, algae and dirt, providing the perfect medium for larger more robust weeds and grasses to take root. 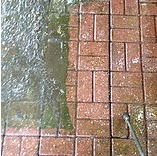 Also oil and other stains will spoil the surface giving your home and driveway a very neglected appearance. 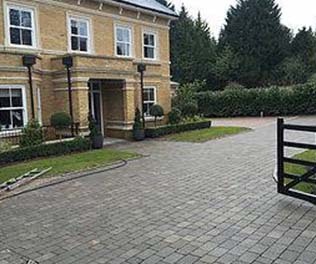 Remember, you see your driveway everyday and because of this you don’t notice the deteriation, you just get out of the car and walk into your home, however others passing by or visiting for the first time get the full picture. 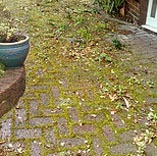 To keep the paving looking its best it should have an annual power wash to remove dirt, moss, weeds etc, be re-sanded and maintained with an application of weed killer. The first step is a general clean up of the area removing any large weeds by hand and removing all liftable pots, bins, mats etc, from the surface. 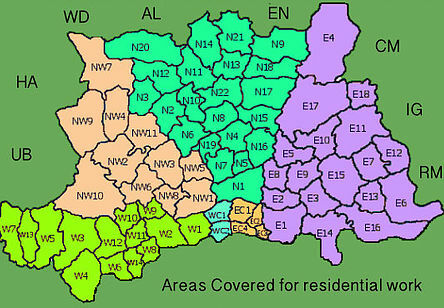 All areas that need special attention are then addressed, oil stains and any other problem areas are treated with a degreaser or appropriate detergent. We then start the wash using our rotary surface cleaners powered by our van mounted pressure washers which are adjusted to the perfect pressure for the job in hand. This is followed by a turbo lance, removing any stubborn weeds, stains and finished with a rinse over the entire area, at the same time washing down any windows doors and areas that may have been splashed during the wash. 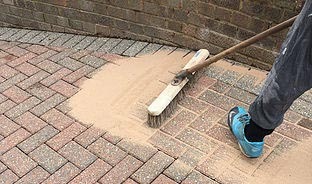 The sand is an integral part of block paving, it’s the glue that holds it all together. If the sand is not replaced to stabilize the block paving the blocks will start to move and sink causing dips and hollows that in time cause the collapse of the driveway. Avoid any contractor that does not include this very important step. Many will try to miss this out because the driveway has to be completely dry before the application of the kiln dried sand, meaning that if the weather is not good they will have to return on another day to brush in the sand. There is a method where the sand can be washed into the joints, it works but usually leaves a lot of sand on the surface with an unsatisfactory finish. The sealant will give a durable gloss or matt finish to the surface, help to prevent weed growth, stabilize the sand and stop oil and other liquids penetrating the surface and make for easy removal. The sanded surface is given a final sweep and then blown over with a leaf blower to prepare the surface. 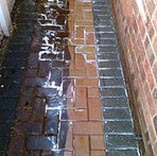 The sealant is then applied by spray, roller or squeegee.